Trust your servicing and repairs to our qualified service technicians and our modern and fully stocked workshop. We design smart, integrated pumping solutions that work with your requirements, environment, and budget. You’ll get the most competent advice by a Certified Irrigation Designer. Our Emerald showroom stocks a wide range of pump & irrigation products suitable for residential, commercial, agricultural and mining applications. Choose to hire pump & irrigation equipment only, or a full hire solution with equipment, people, and project management. We know your industry. We know the local conditions. We know the right water solutions. By choosing CQ Pump & Irrigation, you’ll get industry-leading brands and products proven for Australian conditions, as well as industry expertise and up-to-date technical knowledge. Based in Emerald in Central Queensland, we understand the local conditions when planning water management solutions for agricultural, residential, commercial, and mining projects. Our shop is backed up with a large stock holding so you’ll benefit from fast and efficient turnaround. Pumps, pipes, tanks, irrigation and hoses….you can find them all in our well-stocked showroom. From large-scale agricultural irrigation systems to small-scale domestic reticulation projects, we not only stock everything you need, but install, maintain and service, too. 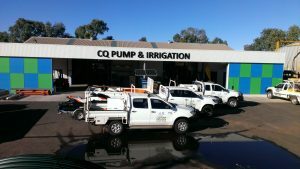 CQ Pump & Irrigation Services has a modern workshop at Hicks Street Emerald with service technicians available for all your specific servicing and repairs. Need help putting it all together? Talk to an expert. We are proud to be associated with Davey as a master dealer of all their products and supplies. Proudly a Member of Irrigation Australia and the National Water Group, Australia’s peak bodies in pumping, irrigation, filtration, water and fluid management, you can trust your water installation is in safe hands when you choose to partner with us. As a member of NWG, we can access the best products for the best prices which directly benefits our customers.